Do pool covers really heat the water? You are at:Home»Pool Covers & Rollers»Do pool covers really heat the water? A very common question we have noticed is “Do pool covers really heat the water?”. There are many pool blanket manufacturers claiming that their pool covers heat the water by up to 8 degrees Celsius. Most people are skeptical about pool blankets’ ability to heat pool water, until they get one or hear it from a friend that has one. And that’s perfectly understandable. It sounds too good to be true. So Do Pool Covers Warm Water? We’ve spoken to dozens and dozens of swimming pool owners, and let me tell you, they have all said their pool water is warmer after installing a solar pool cover. But don’t take my word for it. After you understand how a solar pool cover works you may be a little more convinced. Firstly, it’s only solar pool covers that heat water. Other pool covers such as thermal and rigid covers retain heat but don’t actually warm the water. 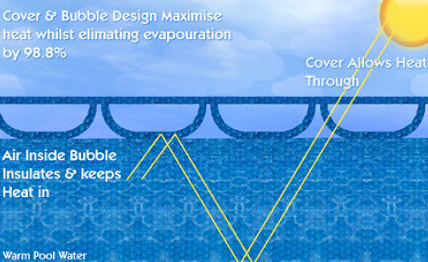 Here’s how a solar pool cover keeps your water warmer. It’s a scientifically proven fact that the majority of heat loses in bodies of water occur though evaporation. The heat loss works much like the way your body cools down when you’re hot. Sweat forms on your body and when it evaporates, that cools you down. The same thing happens with your swimming pool. Well not the sweating part. When pool water evaporates, it carries with it heat and therefore cools the pool water down. So if evaporation is prevented, then there will be much least heat loss. So simply put, covering your pool you will help warm the water up. Solar pool covers are generally translucent, in other words, they allow light to pass through them. By allowing the sunlight in, the sun’s rays naturally warm the pool water. Thermal pool covers, which are opaque (don’t let light pass through), and therefore do not capture the sun’s energy. And the final way that the pool cover keeps your pool warm is by insulating the warmed water. The air bubbles in the pool cover act as an insulator in a similar way that a thermos will keep water warm. A pool cover keeps your water warmer for longer. You’ve only got to take a lot around the internet at forums such as www.whirlpool.com.au to see that pool covers do in fact work for most people. The extra warmth you’ll get from your pool cover depends on many factors such as; pool size, if you do or don’t have heating, how often you use your pool cover, if the pool is in full or partial sun, how windy the area you live in is and how hot and cold the weather gets. To answer the question at the beginning of this article again, Yes, pool covers really do heat the water.